Camping — it is an activity that is older than the United States itself and has been a staple of American family fun since the days of the first settlers. However, time has changed as pilgrim parents weren’t trying to compete with the Xbox. When parents try to rally the troops and garner a bit of enthusiasm about campfires and sleeping under the stars, they are often met with resistance from their children reluctant to give up the modern conveniences of WiFi and multiplayer games, Netflix and Twitter, even if only for a few days. This is why parents need to step up their game and approach camping with a different strategy. 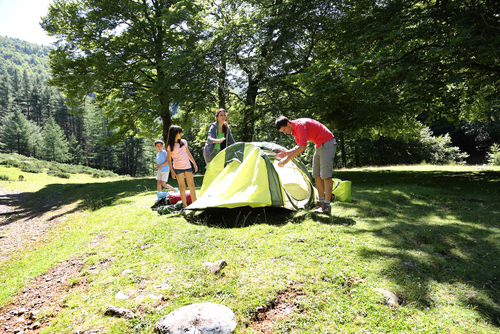 When you invent new and exciting activities to do while camping, you can entice your family to come along willing and create new traditions to be treasured in their memories for years to come. After a long and possibly unpleasant car trip that may or may not have included several arguments over the music selection, a couple heated discussions concerning whether or not to ask for directions, as well as one or two “Stop it,” “No, you stop it,” whining matches from the backseat, it’s best to just channel that competitive energy that has been brewing during the car ride into a productive activity. The tent race involves splitting the camping party in half, making sure there is at least one adult on each team, and then time how long it takes each team to completely set up their tent. The team that takes the longest has to handle the after dinner cleanup that night, and as the tradition catches on, there will be the added incentive to beat the best time from the year before. An added bonus here is that you are actually teaching your children to develop skills like communication, teamwork and problem-solving, skills that can potentially boost their participation and performance in school. First and foremost, this activity requires proper safety precautions and supervision, but once the ground rules have been set, a simple “most accurate shot wins” competition can begin. Or, if you have younger children and want to teach them about gun safety and wildlife, a game of “Safari” is perfect. To play the game, you will need airsoft guns and accessories for each shooter and a box of animal crackers. Set up different animal crackers within a free and clear domain and have each child see which animals they can locate, take aim, and fire. This activity allows you to teach your kids about proper hunting etiquette, endangered species, and appropriate weapon handling when in the field. After an exciting day of friendly competition, outdoor exploration, and a hearty meal cooked over an open fire, nothing beats a good campfire story. A great exercise in creativity and imagination, you can go around the campfire and have each person spin a tall-tale about the very campsite you and your family camping in that night. Or if you prefer to make the storytelling a united effort, you can play a game of “Finish My Sentence.” For this game, the first player begins a sentence but leaves out the very last word. For instance, “It was a full moon night, just like tonight when the campers first set eyes on …” The second player then adds the missing word, any word of their choice, and continues on with the story by adding a second sentence, again leaving the last word out. Then the third player chooses a word to fill in the blank, and the story continues round and round the campfire until a player decides on an ending. You’ll be surprised how much you learn about your family members just based on the words they choose to continue the story! So the next time you plan a family camping trip and want to make it truly memorable, integrate a few family camping traditions that are unique to your family’s camping pilgrimage, and will make your kids want to keep coming back. The right traditions will entertain and inspire your family to keep these traditions for years to come. This entry was posted in Family and tagged camping, family.